While in the area, I made side trips to the Bulloo Overflow, which is located in south-west corner of Queensland, and to the red sandy dunes of the Strzelecki Desert to the west of Cameron Corner. On the way up I also stopped at Mutawintji National Park, which is located about 100 north-east of Broken Hill. Amongst the birding highlights for the trip were Eyrean and Grey Grasswren, Grey Falcon, Bourke's Parrot, Cinnamon Quail-thrush, Pied Honeyeater and Ground Cuckoo-shrike. Before the trip, my 10 year old son asked me to bring back some red desert sand - which, fortunately I remembered - and my 3 year-old son just missed me. During my stay in Sturt National Park I camped at Dead Horse Gully, a campground near Tibooburra, and the Fort Grey campground, in the far west of the park, and just east of Cameron Corner - the point in the outback where the boundary lines of New South Wales, Queensland, and South Australia meet. 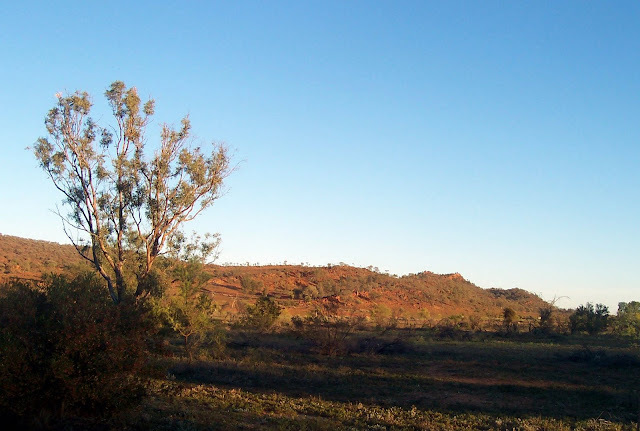 Other campgrounds include Mount Wood near the Mount Wood Homestead, and Olive Downs, set in the set amongst Mulga trees on top of the 'Jump-Up' Range. There is also accommodation at the Mount Wood Homestead, and several hotels and a small caravan park in Tibooburra. Most roads in Sturt National Park and north-west NSW are gravel with some sandy stretches. Although these can be driven with 2WD, I recommend a 4WD or decent soft-roader 4WD (such as X-Trail, Outlander, Forester or Grand Vitara. A high-level 4WD would be essential after heavy rain 4WD. As mentioned, to reduce the amount of driving, rather than drive from Melbourne, I flew to Mildura and then hired a car, and effectively halved the travel distance of the trip. For the trip I hired a Mitsubishi Outlander. Just between you and I technically I wasn’t allowed take the Outlander off-road. 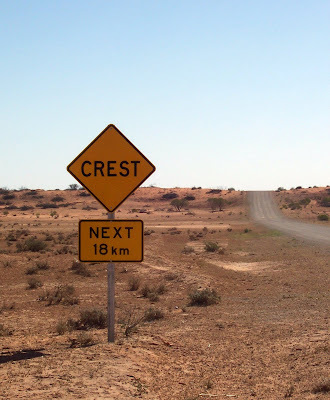 But, I ask you, is travelling around Sturt National Park and the Strzelecki Desert off-road? As an aside, when I returned the car back to the hire care company, they described it as "dirtiest car ever returned!" - despite the fact that I cleaned it inside and out at a carwash in Broken Hill. Amazingly, though, I didn't incur any additional hire costs. Chirruping Wedgebill. Image Greg Oakley. My particular aim was to see Eyrean and Grey Grasswren. As a child I remember spending hours looking at these two particular Grasswren species in early editions of The Slater Field Guide to Australian Birds - the hardback copy, Passerines. In this text, their distribution appeared as small dots in the middle of the vast Australian continent. I remember thinking about how it would be a great adventure to try and track them down in the wilds of the Australian outback. In Cayley's What Bird is That?, the Grey Grasswren doesn’t even appear in the plates, and it wasn’t scientifically described until 1968, although it was actually observed in 1921 by Arthur Chenery (a founding member of Birds Australia). The Eyrean Grasswren intrigued me most. First discovered at Macumba River in 1874 (north-west of Lake Eyre) it then disappeared and was considered extinct. 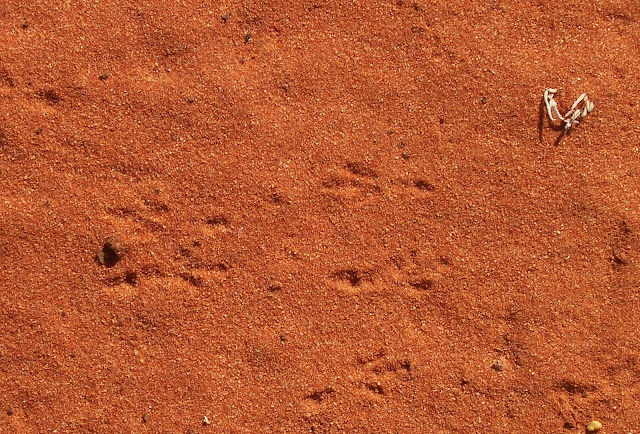 In 1961 it was re-discovered - seen in the same area - although it wasn't until 1976 that the SA Museum was able to confirm the birds' existence, in the Simpson Desert. Grey Grasswren habitat - Lignum at the Balloo Overflow. Believe it or not - there is a bird immediately in front. My first target species was Grey Grasswren. To find them I had four possible sites within reach of where I was staying in Sturt National Park. Two were well-over 250 km away, and via some pretty tough roads. These were: near the bridge over Cooper Creek on Adventure Way (the road to Innamincka), just east of Ballera Gas Centre; and an area in front of the Noccundra Pub (on Thargomindah Rd), in the Lignum between the pub and the river. These sites would have to wait until another time. The other two sites for Grey Grasswren where much closer. They were within the Bulloo River overflow, immediately adjacent to Sturt National Park. Perfect! The Bulloo River overflow is an isolated drainage floodplain in western Queensland, with its lowest reaches extending to near Tibooburra in NSW. The whole area is about 9,000 sq. km. 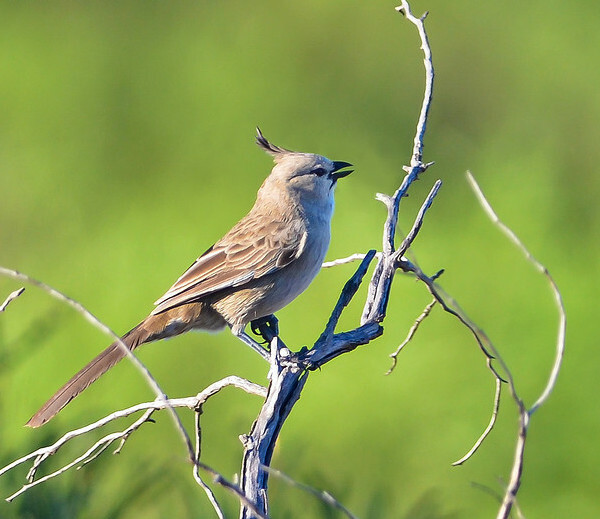 and has been classified by BirdLife International as an Important Bird Area (IBA) due to the high number of waterbirds present during flood periods, and - the reason I was visiting the area - because it contains the entire population of a subspecies of the Grey Grasswren (ssp barbatus). There are two main places to see them in the Bulloo Overflow are just south of the Adelaide Gate (where you can contact land the owners at Narrewarra Homestead, or drop just by them n route), while another is on Pyampa Station just north of Wompah Gate in Queensland. I chose to search for them at Pyampa Station, just north of the Wompah Gate, a site that can be reached on foot via a small creekline. 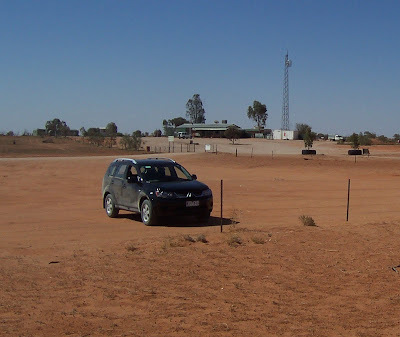 To get there from Tibooburra, drive north for 22 km, then turn right to the Wompah Gate, which is a further 33 km. From the gate drive north for another 5.3 km until you reach a small (usually dry) creek line. Walk east along the creek for approximately 2 km. Here there is a bore with a windmill on your right. Continue north-east along the creek for another 1.3 km until you come to a fence. Cross the fence. From there you can see Tangled Lignum (Muehlenbeckia florulenta syn. M. cunninghamii) directly in front of you. Walk northeast until you come to the larger clumps of Lignum (see image above) and search this area for the Grey Grasswren. 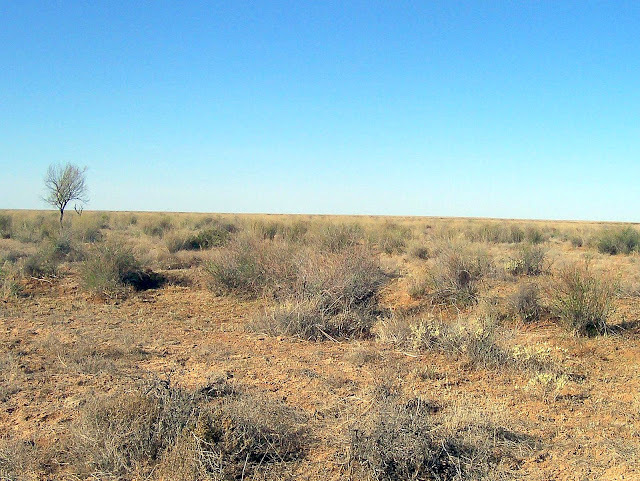 Grey Grasswren are found only in this type of habitat i.e. areas dominated by Tangled Lignum, a hairless perennial shrub about 2.5 m high. 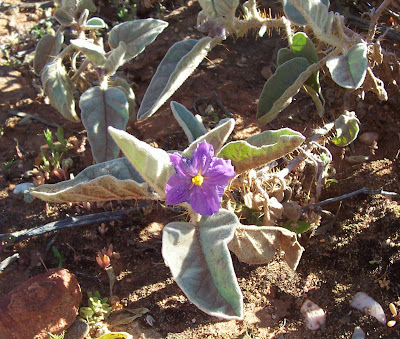 It's the perfect plant for inland areas - it has a very deep root system, that penetrates to at least 3 m, and consequently have a high tolerance to drought and salinity. After a bit of searching in the Lignum, I found a small party of four birds (maybe a few more). What a brilliant bird! Most of the birders I've met usually describe this site as being barren and not particularly inspiring. However I found it to be quite the opposite, and it produced a surprisingly long list of birds. 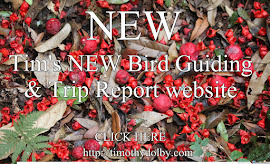 This included Emu, Cockatiel, Budgerigar, Australian (Mallee ssp) Ringneck, Blue Bonnet (red-vented ssp haematorrhous), Little Corella, Chirruping Wedgebill, Diamond Dove, Red-backed Kingfisher, Rainbow Bee-eater, White-backed Swallow, White-winged Fairy-wren, Yellow-rumped Thornbill, Southern Whiteface, White-browed Babbler, White-winged Triller, White-breasted and Black-faced Woodswallow, Crimson and Orange Chat, and honeyeaters such as Spiny-cheeked, Singing and White-plumed. Around the dam there were a few waterbirds: Hoary-headed Grebe, Grey Teal, Red-kneed Dotterel and there were several Banded Lapwing in the gibber north of the dam. White-backed Swallow nests near Fort Grey. My second target species was the Eyrean Grasswren. 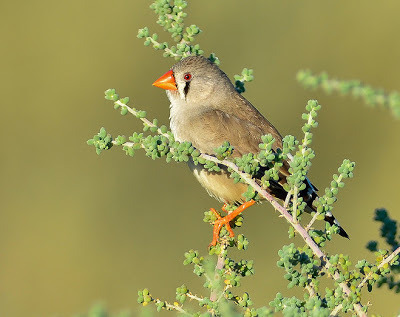 I'd actually been within a stones throw (relatively speaking, in terms of country km) of this bird last year, while birding along the Santa Teresa Rd south of Alice Spring, where they are found several hundred kilometres further south, near the Old Andado Station on the northern edge of the Simpson Desert. On this trip I was targeting them in the far north-east of South Australia. Eyrean Grasswren is a bird that has intrigued me since childhood, with its distribution in my old field guides a tiny dot on the vast map of outback Australia. Discovered in 1874 it was thought to be extinct until its re-discovery in the 1960s. 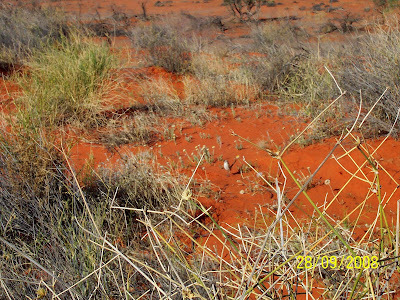 The habitat for Eyrean Grasswren is the red sandy ridges of the Simpson and Strzelecki Desert, with a preference for feeding around Sandhill Canegrass (Zygochloa paradoxa), which grows as large sprawling tussocks on the crest and flanks of the dunes. To look for them, I drove west along Fort Grey Rd, through Cameron Corner and into South Australia. From there I drove west to the first section of red-sand dunes, stopping at the first decent sized dunes, 36 km west of Cameron Corner. After a bit of walking I sound a family of birds on the very top of the red sandy dunes, on the south side of the road, hanging around the larger clumps of Canegrass. An interesting point here, as mentioned, they had a definate preference for the Canegrass rather than the nearby clumps Spinifex (Triodia pungens) that dominated the small valleys between the dunes. To me this seemed unusual, especially when you consider than Grasswren species in general have a symbiotic preferecence for Triodia. Cinnamon Quail-thrush (ssp cinnamomeum) were also here, seen several times, usually walking along the side of the sand-dunes, while other birds seen here where Variegated Fairy-wren, Diamond Dove, Horsfield's Bronze-cuckoo, Red-backed and Sacred Kingfisher, Crimson Chat, Zebra Finch and White-backed Swallow. next 18 km. This sign is 35 km west of Cameron Corner. A massive park (over 340,000 hectares), Sturt National Park is located in the far north-west corner of NSW. It protects an enormous arid landscape of Mulga bushland, intermixed with gibber plain and ephemeral creeks lined with River Red Gum and Coolabah. 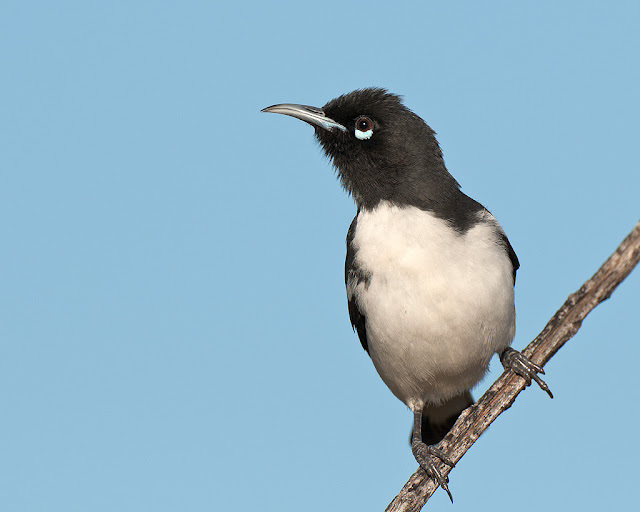 Some of the best birding spots in Sturt National Park are along the Fort Grey Road and the Dunes Scenic Drive. Birds commonly seen include Emu, Nankeen Kestrel, Crimson Chat, Black-faced Woodswallow and Crested Pigeon. White-backed Swallow were also reasonably common - they which nested along the roadside, 11 km east of Cameron Corner. Along this road I also saw a small party of Australian Pratincole, and had a possible Grey Falcon - the bird zoomed over a ridge just west of Fort Grey. When visiting the west part of the park I camped at the Fort Grey Campground. This must surely be one of the best places in Australia to see Ground Cuckoo-shrike. While there, they were a campsite bird, as were Yellow-throated Miner, Black-faced Woodswallow, Crested Bellbird, Chestnut-rumped Thornbill, Galah, and Little Corella, as well as Red-browed Pardalote, Black-eared Cuckoo and, at night, I heard several Australian Owlet-Nightjar and a Spotted Nightjar. It is worth noting that during the heat of the day (30 degrees + during the time I visited) the Fort Grey campsite may seems dusting and uninviting, however at dusk and dawn - with changing light, and when the birds began to move about -the campsite transformed into an extremely pleasant place to be. In the evening, I sat there and enjoyed a nice cold beer and watched Ground Cuckoo-shrike move around the campground. Does it getting any better! The Fort Grey campground is also on the edge of the ephemeral Lake Pinaroo. A pleasant walk through the lakes River Red Gums produced a small flock of Bourke's Parrot (seen on the ridge between the lake and the campground), Australian Ringneck, Budgerigar, Black-tailed Native-hen, Banded Lapwing, more Ground Cuckoo-shrike, Red-browed Pardalote, Black-eared Cuckoo, White-breasted and Black-faced Woodswallow, Yellow-throated Miner, Australian Owlet-Nightjar (flushed from a tree hollow), Orange Chat, Crested Bellbird, Chestnut-rumped Thornbill and Spotted Harrier. Although there was no water in Lake Pinaroo when I visited, when there is, Lake Pinaroo (a Ramsar site) can support large numbers of waterbirds and shorebirds such as Freckled and Blue-billed Duck and Brolga. It was along the Toona Gate Road that I got excellent views of a Grey Falcon. I had spent quite some time birding in this area, particularly those spots with panoramic views over the landscape. The best views are near McDonalds Peak. Eventually (after two days of moving about) I had excellent views of a Grey Falcon, which flew directly over the car, disappearing as quickly as it appeared. The 55 km Gorge Loop Rd starts in the south-east side of Sturt National Park. I found the loop to be one of the most interesting birding drives in park. 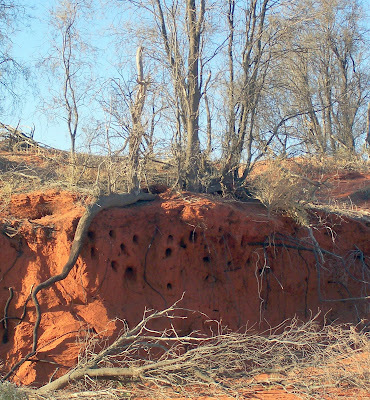 The habitat along the first section is made up of large areas of gibber. The loop then traversed through rolling hills and along wooded creek lines. It begins near Mount Wood campground, accessed via Tibooburra Rd. Around the campground and along Thomson Creek there were Emu, Red-backed Kingfisher, Red-browed Pardalote, Crimson Chat, Black-faced Woodswallow and Apostlebird. 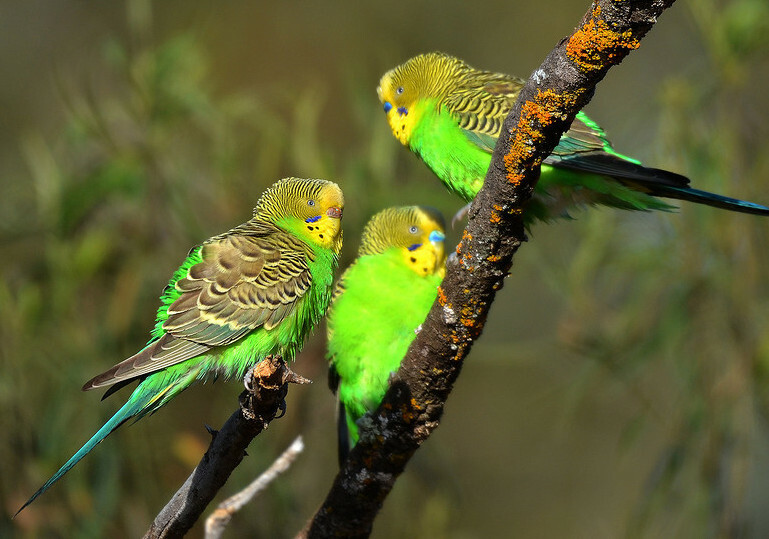 Budgerigar throughout most of north-west NSW. Image Greg Oakley. Beyond the Mt Wood campground the road passes through a section of gibber, where I found several Cinnamon Quail-thrush feeing on the ground (approximately 2 km north of campground) as well as Orange Chat, Chirruping Wedgebill and Chestnut-crowned Babbler. 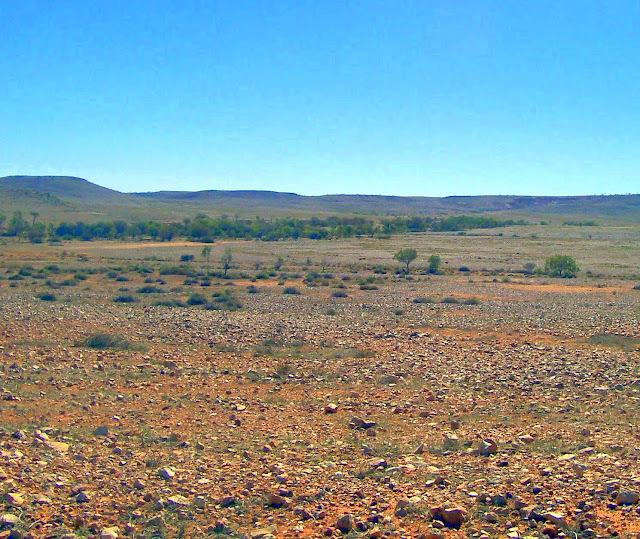 This area of gibber is also meant to a reliable site for Gibberbird. Perhaps the most surprisingly birds seen along the loop was a small flock (20) of Whiskered Tern, which were flying very slowly south over the gibber. At the time this seemed extra-ordinary. During 2008 western NSW was undergoing a serious drought, and consequently there was no land water for hundred of miles (the Darling River, for example, was bone dry). They were obviously migrating south across the interior of the Australia desert. Perhaps I would catch up with them later in the year in Victoria. After a while the landscape along the road changes, traversing rolling hills and the wooded creek line of Twelve Mile Creek. Along here there were Emu, Red-backed Kingfisher, Blue Bonnet, Crimson Chat, Black-faced Woodswallow and Black-eared Cuckoo, White-winged Fairy-wren, and honeyeaters such as Singing, White-plumed and Spiny-cheeked. Raptors along here include Spotted Harrier, Little Eagle, Nankeen Kestrel, Brown Falcon and Black Kite. Cameron Corner and my hire car, an Outlander. admittedly I was the only 'soft roader' out there. Towards the northern end of the Gorge Loop Rd a good spot to birdwatch is near the Horton Parkin ruin and its associated water bore. It was one of the most lively sites in Sturt, with Black-eared Cuckoo, Variegated Fairy-wren, Zebra Finch, Southern Whiteface, Pied Butcherbird, Little Crow, White-winged Triller, Brown and Rufous Songlark, Black-faced Woodswallow, Common Bronzewing and several water birds including a White-necked Heron, Hoary-headed Grebe, Black-fronted Dotterel and Black Duck. Nearby there were some areas of flowering Eremophila, where there was small numbers of Pied Honeyeater, as well as Spiny-cheeked, White-plumed and Singing Honeyeater. The Gorge Loop Rd then connected up with the Jump Up Loop (44 km). After 2 km, I arrived at South Myers Tank. It contains water pumped from a bore, and there's a bird hide on the north-western corner. Around the bore were some really interesting birds, such as Pink-eared Duck, Plumed Whistling-Duck, Hardhead, Black-tailed Native-Hen, Black-fronted and Red-kneed Dotterel. Perhaps this was where the Whiskered Tern had been feeding. During the course of the day, the bore was visited by Galah, Little Corella, Cockatiel, Orange Chat and Zebra Finch. Although I didn't see any, in some years Flock Bronzewing come into drink. Around the Olive Downs Campground there were Chestnut-crowned Babbler, Chestnut-rumped Thornbill, Southern Whiteface, and a few Black and Pied Honeyeater were feeding on flowering Eremophila along a ridge line around the campsite. On my final morning in the park a walk around the Dead Horse Gully Campground produced Diamond and Peaceful Dove, Cockatiel, Blue Bonnet, Budgerigar, Red-backed Kingfisher, Rainbow Bee-eater, Chirruping Wedgebill, White-backed Swallow, White-winged Fairy-wren, Singing and Spiny-cheeked Honeyeater and Red-browed Pardalote. All up, not bad, not bad at all! To break the trip up, on the way back to Mildura I camped at Mutawintji National Park, 130 km north of Broken Hill. A delightful national park, it was described to me as a mini Flinders Ranges. Considering there’s an isolated population of Yellow-footed Rock Wallaby (first discovered here in 1977), the description seems quite appropriated. The park is made up of a series of rocky red gorges along Red Gum-lined creeks, surrounded by chenopod and shrubby plains. When I was there, Mutawintji was teeming with birds, particularly parrots such as Mallee Ringneck, Mulga Parrot, Galah, Little Corella and Major Mitchell's Cockatoo. The campsite was populated by White-winged Chough and Apostlebird. There was also a hot showers – my first in over a week! Other birds I saw at Mutawintji, in no particularly order, were Chirruping Wedgebill, Tree Martin, Black-faced Cuckoo-shrike, White-winged Triller, Red-capped Robin, Rufous Whistler, White-browed and Chestnut-crowned Babbler, Variegated Fairy-wren, Yellow-rumped and Chestnut-rumped Thornbill, Southern Whiteface, Striated Pardalote, Yellow-throated Miner, Spiny-cheeked Honeyeater, White-breasted Woodswallow, Pied Butcherbird, Common Bronzewing, Pallid Cuckoo, Crested Bellbird, and corvid such as Little Crow and Australian Raven. Mutawintji National Park, ~100 km north-east of Broken Hill. It's sometimes described as a mini-Flinders Ranges. Some of the raptors seen in the park included Brown Goshawk, Little Eagle, Spotted Harrier and Wedge-tailed Eagle. Although I didn't see any, Mutawintji also has a resident pair of the rare Grey Falcon. Another bird on Mutawintji bird list is Hall's Babbler, the southern-most distribution for this species. It's found mainly in the northern area of the park, an area restricted to public access. Yellow-footed Rock-Wallaby also occur here. 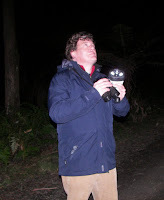 At night, Southern Boobook called continually - interestingly I didn’t hear them at Sturt National Park - as did several Australian Owlet-nightjar. Gibber along the Gorge Loop Rd - a good site for Cinnamon Quail-thrush.